This is the third jam recipe as part of our pectin discussion. You may like to check out the past two Advanced Plan jam recipes for Strawberry Jam and Cherry Jam. Today we’re using rhubarb, another low glycemic fruit (well technically it’s a vegetable, but most people call it a fruit, kind of the opposite of a tomato…). This jam is very low in sugar, and by carb count, you can have about a 2 Tablespoon serving if you are on the Advanced Plan. I add a bit of honey, because it needs the little bit of sugar to make the pectin gel up. Rhubarb has so little sugar in it naturally that we need to add some to move the process along. Both Dave and I grew up with bushes of rhubarb in our backyards. I think it’s a pretty common thing to grow in Michigan (maybe the northern mid-west) if you have the room for it. If you asked Dave what his favorite pie is, he’ll always tell you his mom’s strawberry-rhubarb custard pie. You just don’t find fresh rhubarb down south like we had in Michigan or Minnesota. There is maybe a couple week opportunity at the grocery store when I can find it tender and perfectly ripe. When I do, I clear out the shelf and make what I can so Dave can have a taste of home. This jam is one I made while living in Minneapolis a few years ago. You get a subtle sweetness from the honey to balance out the tart bite of the rhubarb. We mix it with fresh strawberries and granola for a refreshing strawberry-rhubarb breakfast. Or we spoon it over pannukakku for a rhubarb-custard dessert. 1.) 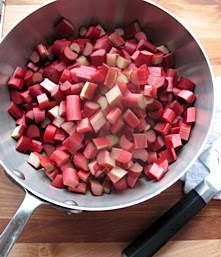 Combine diced rhubarb, honey, xylitol, and lemon juice in a non-reactive pot. Stir and combine. Chop the reserved lemon rind and place it in the muslin bag / tea ball. Add the bag to the pot, cover, and place in fridge for 24 hours. 3.) Ladle jam into jars, leaving 1/4 inch space at the top for air. Push out bubbles with a spatula. Place lids on jars and place in a pot of boiling water for 10 minutes. Remove from pot and set on counter to cool. I check the lids for proper seal after about 15 minutes before I dump out the hot water pot from the stove.